Located 1,000 miles off the east coast of Africa, the Seychelles islands are famous for their unspoilt beaches and breathtaking tropical forests. Here, glittering turquoise oceans lap gently against palm-lined beaches, as the slower pace of island life encourages you to leave your day-to-day worries behind, making this archipelago one of the world’s leading venues for destination weddings. If you are planning a wedding abroad, Kempinski Seychelles Resort Baie Lazare and its experienced events team will ensure your Big Day is everything you imagined it could be. Set in dazzling surroundings of untouched, natural beauty, this beachfront paradise offers a private haven for romantics at heart. Whether you dream of getting married beneath swaying palm trees with the ocean as your backdrop or surrounded by verdant tropical gardens, there really is no place more beautiful to begin your life together. wedding packages and honeymoon offers to let you begin married life in style (View our Seychelles wedding venue packages here). We understand that the prospect of organising a destination wedding can be overwhelming – that is why Kempinski Seychelles Resort Baie Lazare has a mission to assist each of our couples in planning a day that is stress-free and truly memorable. What sets us apart from other wedding venues is our commitment to each remarkable moment that makes up your special day. Our experienced wedding planners will customise your organisational needs from beginning to end to create a once-in-a-lifetime, seamless experience for you and your guests. Whatever your vision for your special day, no request is too large or small. From simplicity to pure elegance, your planner will help make sure you and your party enjoy a faultless wedding experience in our exclusive corner of paradise. Click here to explore our unique approach to creating beautifully romantic wedding ceremonies. The hotel can cater for wedding parties of between 2 and 100 guests at a range of memorable indoor and outdoor venues. Whatever your favourite dishes, drinks or choice of music, your planner should be able to arrange it – click here to view our approach to wedding receptions. 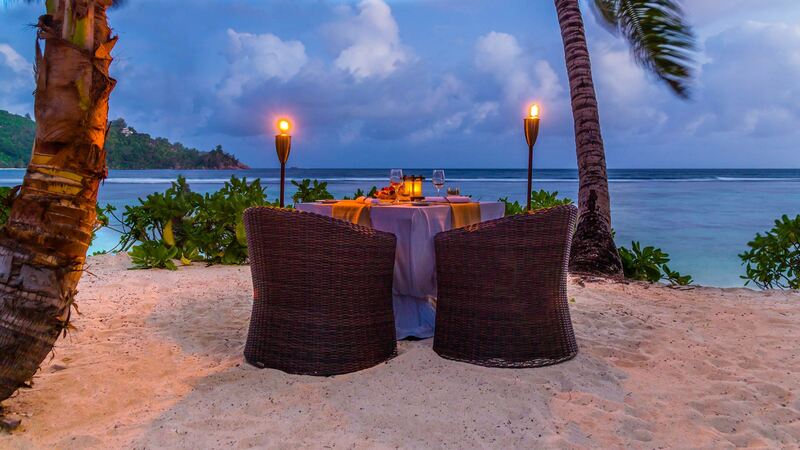 The Seychelles is a remarkably romantic destination and the perfect place to pop that all-important question. Nestled in the foothills of a verdant mountain range, with direct access to a secluded beach, Kempinski Seychelles Resort Baie Lazare offers a memorable location for couples about to embark on the journey towards becoming Mr and Mrs. Guests are invited to surprise their significant other with an unexpected candlelit dinner for two on the beach, where would-be suitors can propose to their love-interest under a sea of stars. More adventurous couples will enjoy an elevated picnic after working up an appetite with a short hike through dense tropical jungle to the top of “Mount Kempinski” – the hotel’s resident hill. With bracing views of tranquil Baie Lazare and the resort below, the scene is set for dropping down on one knee and asking that all-important question. To make your dream of tropical wedded bliss a reality, contact our team on +248 438 6669 or email weddings.seychelles@kempinski.com to begin planning a fantastic and memorable proposal, wedding or honeymoon.